The Southern Ocean encircles Antarctica, dividing the polar regions from the warm tropical ocean. It is home to the world's strongest ocean current, the Antarctic Circumpolar Current, and is the primary location where ancient, deep ocean water is upwelled to the surface. The Southern Ocean controls the natural release of CO2 from the oceans, helps to absorb anthropogenic CO2 and modulates transport of heat towards the Antarctic ice cap. Idealised numerical modelling studies. 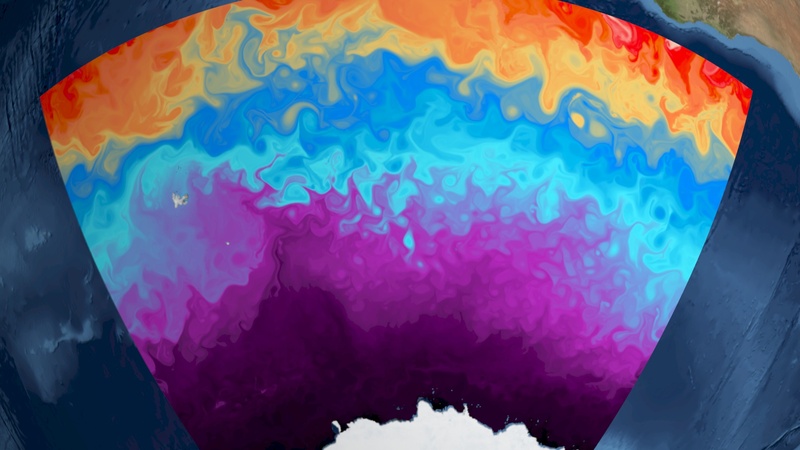 These models are run at high resolution (explicilty resolving geostrophic turbulence), and are used to examine the sensitivity of the ocean's overturning circulation, deep upwelling of nutrient rich waters and the strength of the Antarctic Circumpolar Current to changes in surface forcing. Laboratory models of the Southern Ocean. Using the GFD's rotating table facility, we drive a circulation in an annular tank using a combination of thermal and mechanical forcing. This experiment is an analogue for the Southern Ocean, and can be used to investigate the fundamental fluid dynamics of such a system. Overturning circulation. 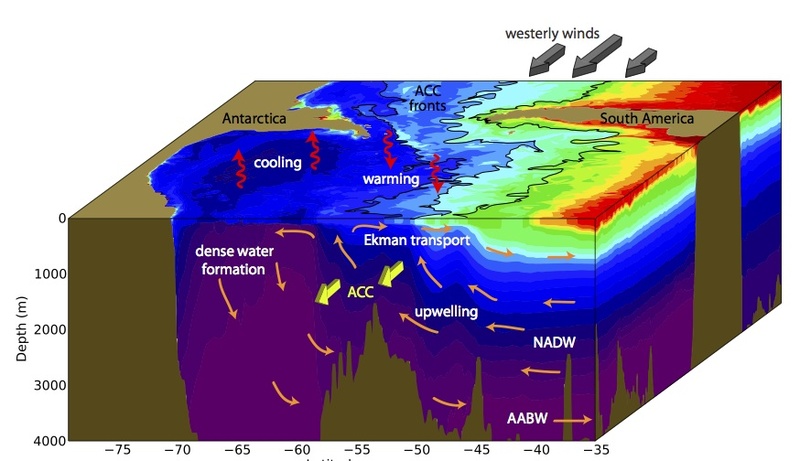 The Southern Ocean's role in the global climate system, includes the formation of the densest water masses in the global ocean (Antarctic Bottom Water). It is also the location where the Atlantic Meridional Overturning Circulation ventilates at the surface. Submesoscales. The Southern Ocean is one location where small scales of motion (eddies and jets) affect the larger scale flow. In addition, even smaller-scale filaments (called submesoscales) appear to be stronger in the Southern Ocean than in other parts of the ocean. The dynamics of submesoscales helps to transport nutrients, heat and carbon vertically in the water column.